The “Berja Panther”, a large black cat that has terrified the town since August, has now been spotted in the mountains above Dalías. 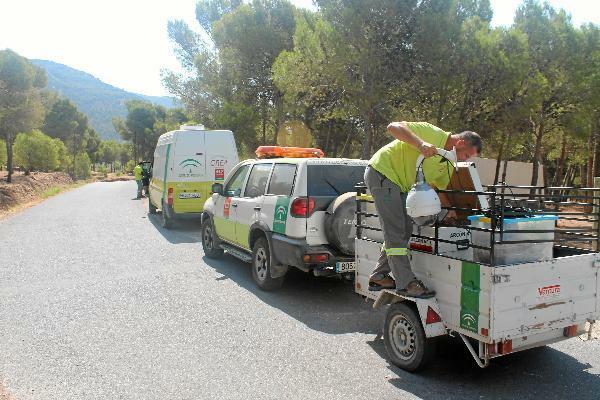 A massive operation by the Junta de Andalucía, Tabernas Zoo, the Seprona arm of the Guardia Civil and specialists from the Ministry of the Environment has so far failed to catch the animal, although spoor has been found. The above photo is just one of the many teams sent out into the mountains this morning, courtesy of La Voz. The animal was originally spotted by several good citizens of Berja, including the Mayor, in the local park, causing what can only be described as pandemonium during the August silly season. Park cordoned off, fathers patrolling the homestead with shotguns at night, and any local tabby unfortunate enough to be out without its collar being rushed off to the local vets for ID. The specialists reckon it’s probably an imported large feline (they aren’t sure of the species) that has been let loose by a collector. It could be anywhere, but it could be dangerous to humans so the search continues. This entry was posted in Blog and tagged berja, dalias, panther by David. Bookmark the permalink. ← Previous Previous post: 6 towns in Andalucia are 50% foreign. 5 of those are in Almeria!